Laboratory studies are indispensable for the differentiation of the various forms of hypertension. With the introduction of new methods, most notably radioimmunoassay, the diagnostic possibilities for the identification of endocrine forms of hypertension have been significantly expanded. The application of these procedures has been broadened greatly by kits offered by pharmaceutical companies and is therefore no longer restricted to specialized laboratories. 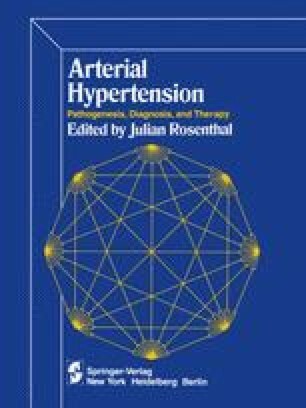 Extensive and nonspecific analytical methods need not be employed in every form of hypertension, however. In the majority of hypertensive patients, particularly the elderly, it is not necessary to carry out an extensive program of analytical laboratory tests based on differential diagnostic and therapeutic considerations. The dilemma of laboratory diagnosis lies in the lack of reliable, simple methods for identification of the frequently occurring primary (essential) hypertension. As a result, the necessary differentiating laboratory tests are neglected or applied insufficiently in the rare secondary forms of hypertension which sometimes are amenable to causal therapy.